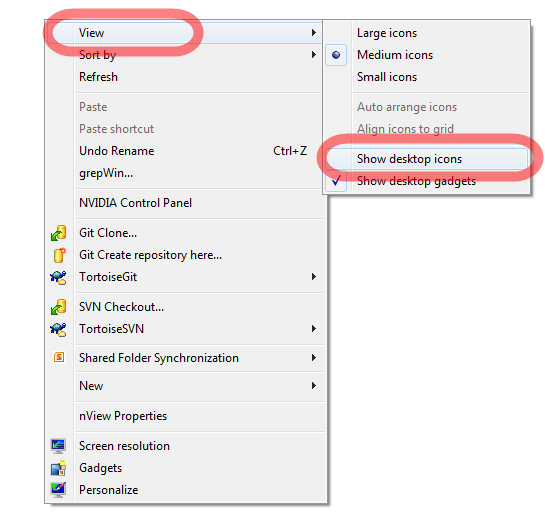 Just right-click on the desktop, select “View” and then “Show desktop icons”. So simple. Should have found this years ago. Works on Windows Vista and Windows 7 as far as I know. Jag använder dock i princip alltid Alt-PrtScr för att bara ta aktivt fönster. I use SnagIt for all screen capture, very highly recommended. This is useful to know for a completely different reason: when you boot Windows 7 and find all your desktop Icons have gone missing (because Windows decided that you’re not worthy), this menu is where you have to go to make them appear again.